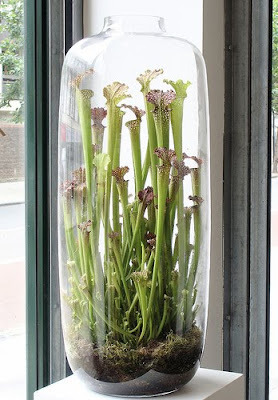 I peeped this pic of this STUNNING terrarium by Ken Marten over at a post at apartment therapy about terrariums. The others were nothing special but this terrarium is out of this world. Talk about a complementary-shaped container for the specimens. The pitcher plants look absolutely ecstatic and I love the clear visuals of the little baby plants peeking up at the bottom of the terrarium. Take a look at the rest of his flickr pool! He also has some fantastic floral arrangements heavy on natural accents and sleek design. Inspiring stuff! You usually think of pitcher plants as ugly and alien. This elevates them to another level. Beautiful! They look like orchids. Pitcher plants are so interesting to begin with, but the way the shape of the terrarium complements these guys brings them to a whole new level. Super find! I feel it looks unnatural, these plants look much better when they are planted in an out door bog garden, surrounded in live sphagnum, and growing amoung other carnivorous plants. I also don't feel the vase is ideal for the plant, it would need a dormancy every year to grow at the peak of health. Also, pitcher plants are beautiful and natural looking in the right environment. If you had used a shorter compact species like S. purpurea ssp. purpurea you could have gotten a more natural look. Maybe its just the knowledge of the plants that is speaking for me, but any thing that combines exotic look and Sarracenia isn't appealing. If your environment is correct, you could try growing a Heliamphora hybrid instead. I love this idea so much I had to share your pic and website on my Pinterest in my craft ideas. I hope it is ok if not just let me know and I will remove it.